In this article we will discuss various ways through which user can recover or reset his current as well as remote windows password. Sometimes it is more easy to reset the windows password than actually recover the password provided user has access to physical system. Often its more important recover the password especially when file system is encrypted or when file system is analyzed for Forensic cases. These files are highly protected and not accessible while Windows is running even for the administrator user. However hackers have found a way to circumvent these protections and access these system files. This section deals with recovering all user account passwords from currently logged in system. In addition to the currently logged on user, you can also recover passwords of all other user accounts on the same system. For this you need to have an account with administrative privileges. Recovering the password using RainbowCrack/BruteForce/DictionaryCrack method. It will dump the password hashes (LM/NTLM) for all the user accounts and mention if any of the user account don't have any password. After getting these hashes, you can submit it to online rainbow cracking services to quickly recover real password. For more details refer to our 'Rainbow Password Cracking Article'. 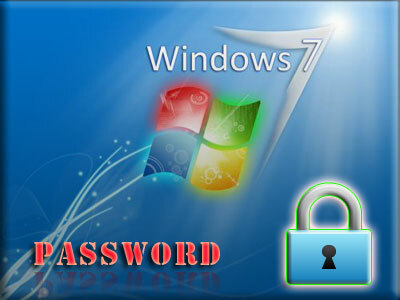 You can also give it try using Windows Password Kracker tool to recover the dictionary based passwords. This section is throw light on how we can recover the password from offline system or just plain hard disk. Generally this is the case with Forensic investigations where in person's disk has been brought in for acquiring further foot prints in the case. In such scenarios it is important to recover the user's login password as the disk may have been encrypted and some of the prominent applications uses user's logon password to secure their data and other credentials. Here we will discuss both scenarios, resetting the current user password as well as recovering the password from offline system or hard disk. Connect your target Hard disk whose accounts needs to be reset to the running system. Boot the system using BackTrack live CD. Chntpw will display all users and you are asked to select particular user to reset the password. On selecting the user, you can choose option to reset the password, where you can enter '*' to set the password to blank. After that you can save the changes and quit the tool. Finally unmount the drives and restart the system from hard disk. Now you can login to the system with that user and blank password. This technique can discover any userland Rootkit process and only way for rootkit process to defeat against this technique is to move into kernel. However, due to low-level implementation, there is slight risk in using this method in production code. Offline recovery involves copying SYSTEM and SAM registry hive files from target system. You can use any of the LIVE CD or other mechanism to access the Hard disk and get the files. Here we will explain how we can get those files using BackTrack Live CD . Make sure that target hard disk is connected to the system. Now boot the system using BackTrack Live cd. By defaults target hard disk file system is mounted on to /mnt/hda1 (or /mnt/sda1). You can check the mount points using the 'mount' command. Then move on to following folder and copy SYSTEM & SAM files to USB or any other media. Once these files are copied, you can use emote system password recovery wizard of either LC5 or 'Cain & Abel' tool to dump the hashes by passing these files. Once password hashes are obtained, next task is to use Rainbow cracking service or Dictionary/BruteForce operation to recover the password as mentioned earlier. 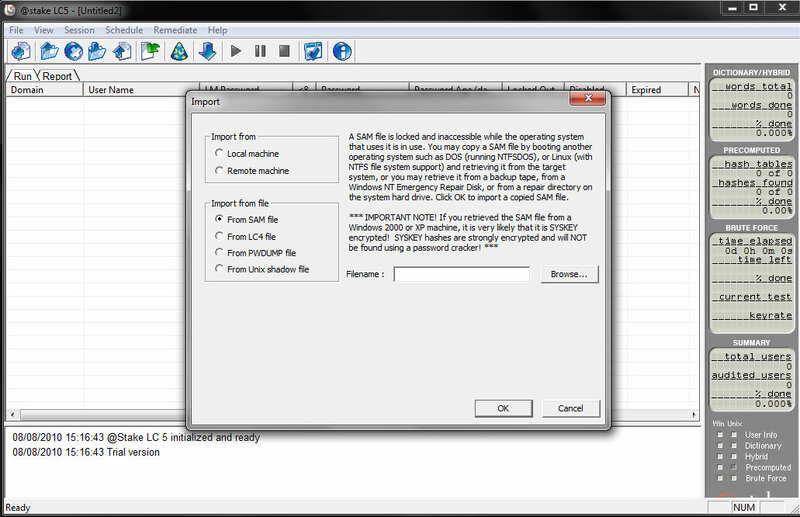 Here is the screenshot of recovering the password from SAM file using the LC5 tool. In case you have forgotten password to your Windows box and just want to login without doing any recovery or reset then Kon-Boot will help you get into any Windows box (and some Linux boxes too) without any password. 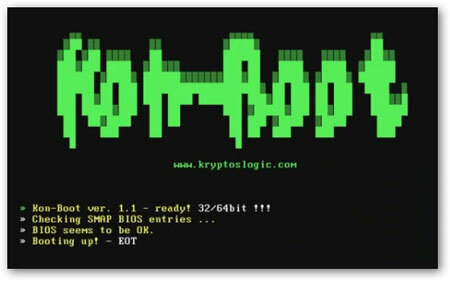 Kon-Boot is an prototype piece of software which allows you to access any password protected Windows system without any knowledge of the password. It dynamically modifies the Kernel memory to completely bypass the default authentication mechanism leading to complete access to any Windows box. Kon-Boot works supports all windows systems starting from Windows XP to latest Windows 7. Newer version now supports both 32 bit & 64 bit platforms. This tool will be more useful for Forensic investigators and law enforcement professionals. Often in the corporate environment, there is a need to remotely troubleshoot user login problems, such as recovering or resetting the password. Generally in such scenarios, every client system will have one administrator account and one or more user accounts. Administrator can remotely recover the user passwords using the tools like pwdump. Pwdump is the great tool which can dump the password hashes not only from live system but also from the remote system. Here is the screenshot of pwdump dumping the password hashes for all account from remote system. Here pwdump prints it to the console, instead you can make it to write to text file which can be later fed into LC5 or Cain & Abel or Windows Password Kracker for brute force/Dictionary crack operation. Alternatively you can submit the hashes to online Rainbow cracking service  to quickly recover the password.
. Rainbow Cracking to quickly recover Windows Password.